Senior pastor of Omega Fire Ministries(OFM), Apostle Johnson Suleman, has released prophecies concerning Nigeria for the new year. 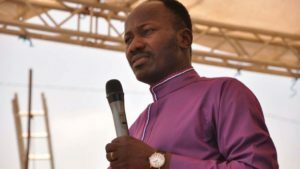 During the cross over service on Monday night, at the OFM headquarters located at KM 132, Benin-Okene-Abuja Expressway in Auchi, Edo state, southern Nigeria Apostle Suleiman predicted that the 2019 election will be 100 percent rigged. He admonished President Muhammadu Buhari to rest and advised the presidential candidate of the Peoples Democratic Party, PDP, Atiku Abubakar to concentrate on the Northern part of Nigeria in his campaign. Meanwhile, it was previously reported that the Catholic archbishop of Kaduna, Most Reverend Mathew Ndogoso, advised clerics to stop making predictions for politicians ahead of the 2019 general elections. Ndogoso also urged clerics to quit the pulpit for politics, if they would not resist “turning themselves to slaves of politicians”. The archbishop made the remarks during the send forth of the first executive secretary of the Catholic Caritas Foundation of Nigeria (CCFN), Reverend Father Evaristus Bassey, in Abuja on Wednesday, December 19, 2018.